Global Civil Helicopter market has been on the comeback trail facing headwinds in a difficult & challenging market environment with a difficult & uncertain global macroeconomic environment marked by ongoing trade wars, regional issues like BREXIT and the volatility in global crude oil prices driven largely by supply side forces. The IMF has already projected a slowdown of the world economy in 2019 & 2020, in its January 2019 outlook, owing primarily to ongoing global trade wars & other macroeconomic challenges as well as regional issues. The Chinese economy registered its slowest GDP growth since 1990 for the year 2018 at 6.6% and seemingly on a slowdown phase over near term. However, the civil helicopter industry has shown resilience with an increase in order intake registered by some key industry OEMs in 2018, with the rally led by market leader Airbus Helicopters, which registered an 18% year on year increase in order intake in 2018. Further, the Introduction of a string of new civil helicopter programs, likely to enter service in 2019 & 2020, is likely to stimulate demand, led by the H160 from Airbus Helicopters, Bell’s 525 Relentless and the AW609 from Leonardo Helicopters. Additionally, improving utilization scenario across global in-service fleet and development of other market segments like EMS, Parapublic & VIP transport is likely to enable the industry to somewhat offset its reliance on the oil & gas sector going forward. The developments on the Urban Aerial Mobility front, however, are likely to present the biggest challenge to civil helicopters in future as the industry is in one of its most disruptive phases ever. The autonomous e-VTOL crafts being developed by the industry for Urban Aerial Mobility applications are being custom designed to overcome the most pertinent limitations & disadvantages inherent in civil helicopters, namely, noise, emissions, operating economics and safety issues with a single point of failure & lack of distributed propulsion, thereby, posing the most serious threat of substitution with the favorable economics & technology aspects likely to drive market forces away from traditional civil helicopters for a majority of the applications over long term. Against this rapidly evolving industry and market backdrop, this Strategy Brief report provides a comprehensive & holistic analysis of the overarching strategy focus across industry OEMs and insights into the key strategies & plans being conceptualized, developed & pursued by these OEMs for the near to medium term horizon to navigate their way through the existing environmental challenges & uncertainty while looking to drive growth for themselves in a relatively improving phase for the industry. 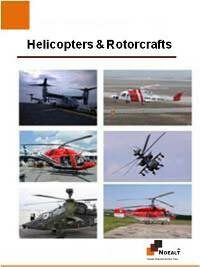 The report would be quintessential for those having strategic interest & stakes in the Global Civil Helicopter market. The report will be extremely useful for Key Decision-Makers, Program Managers, Global Procurement Managers, Defense Contracting Executives & Departments, Top Management of Industry Players & Other Companies, Industry OEMs, Suppliers, Vendors, Associated Equipment Manufacturers and other Key Players in the Industry Value Chain.